Montreal – July 18, 2011 – Regardless of age or swimming ability everyone is at risk of drowning. 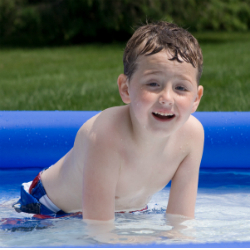 The Trauma Centre of The Montreal Children’s Hospital, McGill University Health Centre warns parents to be vigilant this summer as it is very, very easy for a young child to drown in as little as five centimetres of water. This warning is prompted by recent incidents involving three Montreal area children under the age of five. Two children were hospitalized; the third child, unfortunately, died. According to MCH Trauma Director, Debbie Friedman, in Canada drowning is one of the leading causes of death of children aged one to four. An overwhelming 50% of these deaths occur in Quebec. Ms. Friedman reminds parents that toddlers and pre-schoolers are very curious and impulsive and unable to recognize potential danger. According to the Canadian Red Cross approximately 60 children aged 14 and under drown, each year, another 140 are hospitalized after nearly drowning. A 2006 Safekids Canada report found nearly 50% of drowning deaths occur in swimming pools, many in private homes with un-fenced or inadequately fenced pools. Supervision, supervision, supervision is key. Parents must keep their eyes on their kids at all times and they should never be more than an arm’s length away. Children under five years of age should wear properly fitted personal floatation devices. This also applies to older children who do not know how to swim. It is strongly recommended that all children take swimming lessons preferably at an early age. Always remember to empty the water from kiddie pools when not in use. Parents should consider taking a lifesaving course. For more information on trauma and injury prevention check out the MCH Trauma website at www.the children.com/trauma.